Tonight’s episode marks the end of Tyler Perry’s House of Payne. With episode 254, House of Payne surpasses The Jeffersons as the longest-running sitcom that’s centered around an African-American cast — by one episode. Tyler Perry is well aware of the contributions of The Jeffersons to television history and invited Sherman Hemsley and Marla Gibbs to recreate their iconic roles on House of Payne. 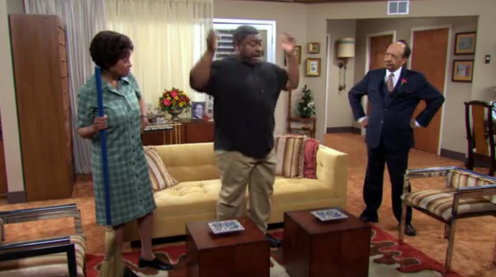 The duo appeared in last year’s “Curtis Jefferson” episode in which Curtis Payne dreams he’s a part of his favorite sitcom. When Hemsley died a couple weeks ago, Perry assembled a tribute video of behind-the-scenes footage. What do you think? Have you seen the House of Payne episode? Hemsley reprised his role as George Jefferson on several occasions. How many can you think of? We all desire a better ending after such a journey. I feel betrayed as a fan as I did with the Jefferson’s ending. Tyler, please try to make right. Why are you ending House of Payne? This was your best show. Get those young, Black, Christians back on the air and put that marriage and Calvin’s mind back together. Be a role model and stop following the money. You have made enough off of your people. I hated to see the show end. I looked forward to watching every week. With so much reality tv that has no substance, and lack of quality, I looked forward to enjoying the humor and serious subject matter combined that this show projected. I definitely didn’t like the way it ended, and will be waiting to see what comes next. Although I do watch For Better or Worse, the show lacks quality and does not measure up against House of Payne. Come on Tyler Perry, i know you can do ONE more final episode and make it right! no one wants to see it end like this. redeem yourself and do one more hour long episode and make all your fans happy, or you may be losing them. who’s with me people? You should really bring the show, love the and a lot of other, hope it comes back. Wishful thinking. I really have enjoyed this show and cannot believe it is ending with such a cliffhanger.. The House of Payne is by far the best tv serious out of the three sitcoms Tyler Perry got going..I would love to see more of this show!!!! That was the absolute worst ending to a show that I have ever seen. Didn’t make any sense! The way the show ended was just stupid! I mean Calvin struggled the whole way to find peace and love and to become his own person and they ended the show by taking everything away from him??? I have loved this show from day one and i was gonna give Tyler’s new show a chance but the way he ended my favorite show on tv i am now not going to he wasn’t fair to us loyal fans i don’t think!!! why not end it on a positive note with Calvin and Miranda instead of like this? The struggles of marriage continue, but at least leave the viewers (especially young black couples and viewers) with a feeling of hope.